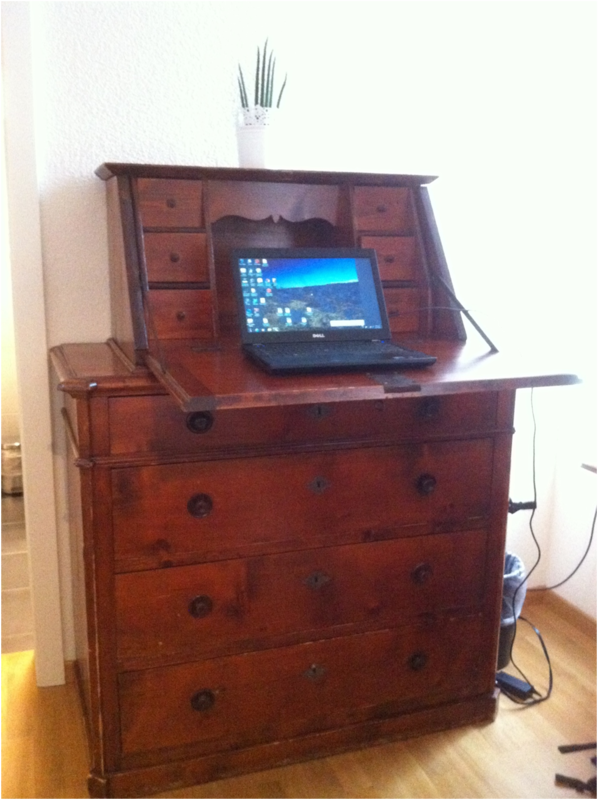 I write this as I am wrapping up extended travel during May and early June 2013. It was a wonderful but exhausting series of meetings. I am sharing some observations and photos from my stops. Salud America! Summit in San Antonio. First stop was San Antonio where I learned about the goals of the new Salud America!, which are to build a network to fight childhood obesity among Latino youth and use research to guide prevention efforts. I’m pleased to be on the advisory board, and Amelie Ramirez and team organized a great Summit. Two of their communication approaches were particularly impressive. They have hired “curators” to search for research and stories of community change related to Latino childhood obesity. They summarize and distribute the research to their ever-growing network. 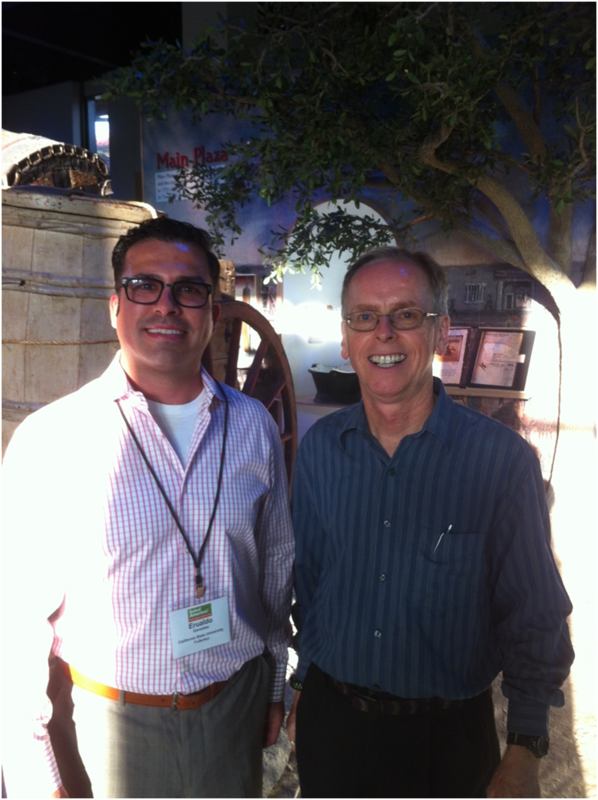 They communicate the success stories through print, social media, and videos. There was a seemingly endless succession of short videos of community champions describing their inspiring efforts and researchers telling how they are using their findings to guide change. The speakers at the conference were consistently outstanding. It was particularly encouraging to hear elected officials describe the actions they are taking to support healthy eating and active living among Latinos. I thank Amelie for adopting active applause to make the meeting more active, giving credit to ALR. I was happy to have a chance to talk with Erualdo Gonzalez, an assistant professor in city planning at Cal State Fullerton. He is on the Program Committee for the Active Living Research 2014 Conference. Here is our photo at a historical museum in San Antonio. I was already a fan of Ghent, because of the visits occasioned by my collaborations with Ilse de Bourdeaudhuij and her many talented colleagues. 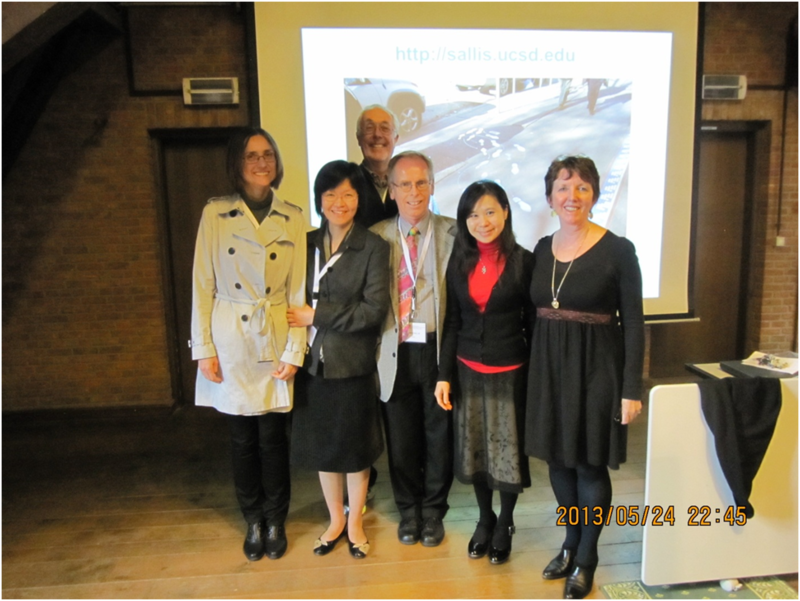 The most eventful part of the visit was prior to the ISBNPA conference, when we had two days of IPEN meetings. 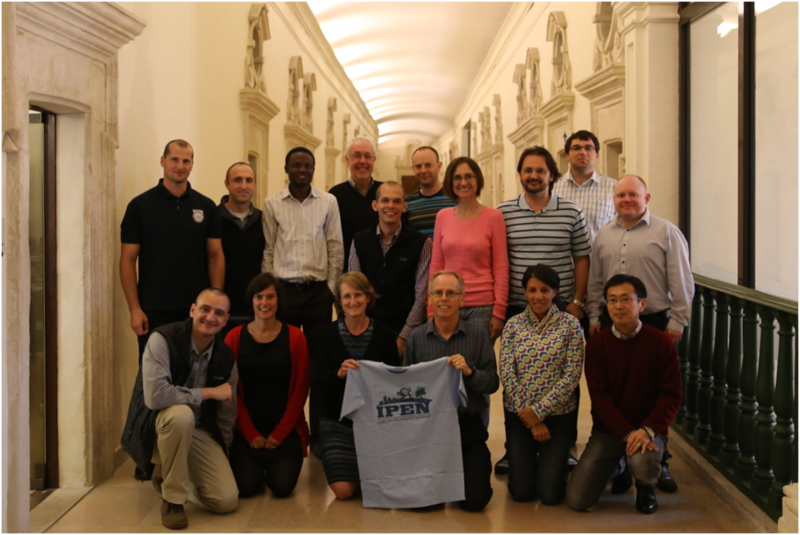 The first day was a writing retreat for the IPEN Adult investigators. 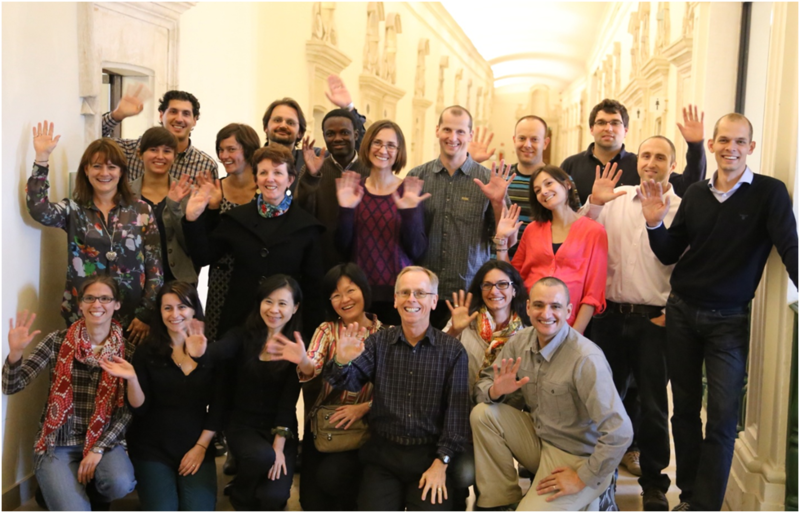 We had attendees from 10 countries, and everyone made very good progress on papers and proposals. 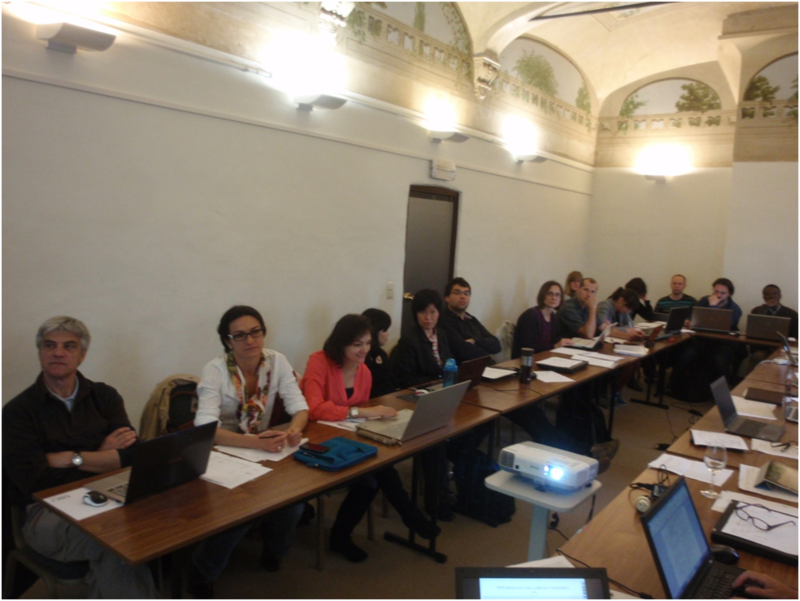 Analyses for several papers have been completed, so long-awaited IPEN Adult manuscripts will be submitted in the next few months. The second day was a meeting of IPEN Adolescent investigators, and 12 countries were represented, including Zaki Islam and colleagues joining remotely from Bangladesh. It was great to get progress reports from all the countries. The commitment to the project, and to following the protocols, was gratifying. Highlights of the day were the overviews of GIS methods from Marc Adams and accelerometer methods from the team of Rodrigo Reis and Kelli Cain. I am sharing photos of both groups from Jasper Schipperijn’s high-tech camera. 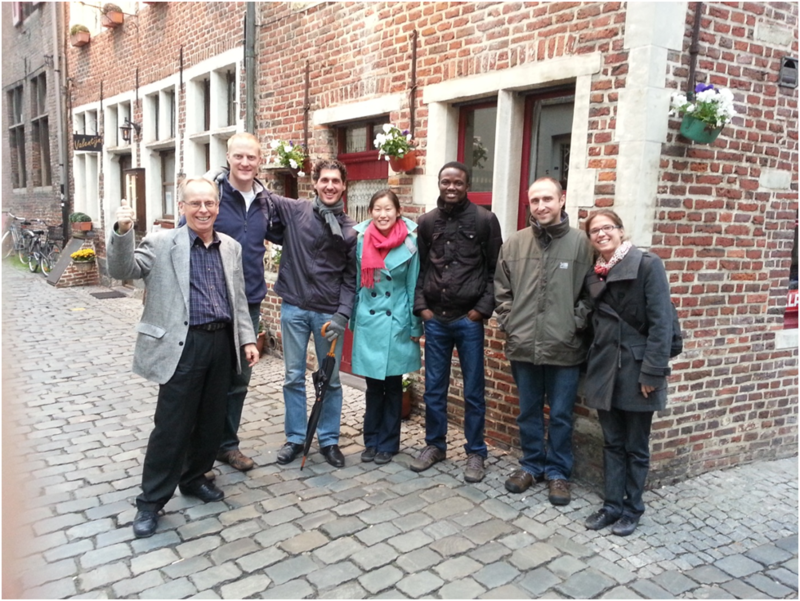 My favorite event in Ghent was the final PhD defense of Dr. Adewale Oyeyemi. It was a personal thrill to see this talented young investigator complete his doctorate. Ghent University’s PhD examination process is rigorous. The student must respond to written comments of external examiners, oral questions of an internal university committee, and finally the oral defense with the external examiners that was witnessed by a large audience including many IPEN investigators. My connection with Adewale started several years ago when he contacted me about his interest in doing a study of built environments and physical activity for his master’s thesis. This was the first inquiry about this field of study I had received from Africa, so I made sure to be supportive of his ambitions. He was well aware of the damage that chronic diseases are already inflicting on Africans, as a result of economic and technological development, and he realized the potential of environmental improvements to slow this process. For several years we have been corresponding, and I have advised him on his studies. Adewale’s research progress has been thoughtful and systematic. We were able to support his attendance at the 2011 ISBNPA conference in Melbourne where he made his first international presentation. It was there that Ilse de Bourdeaudhuij, Benedicte Deforche, and Delfien van Dyck arranged for Adewale to complete his doctoral studies at Ghent University. Only two years later he completed his degree, appropriately timed to coincide with the 2013 ISBNPA conference. And he really completed his degree in style. His PhD included 8 published or submitted papers, all related to built environment and physical activity in Nigeria. It was a joy to witness this professional triumph, and afterwards more than 50 people celebrated at a dinner. 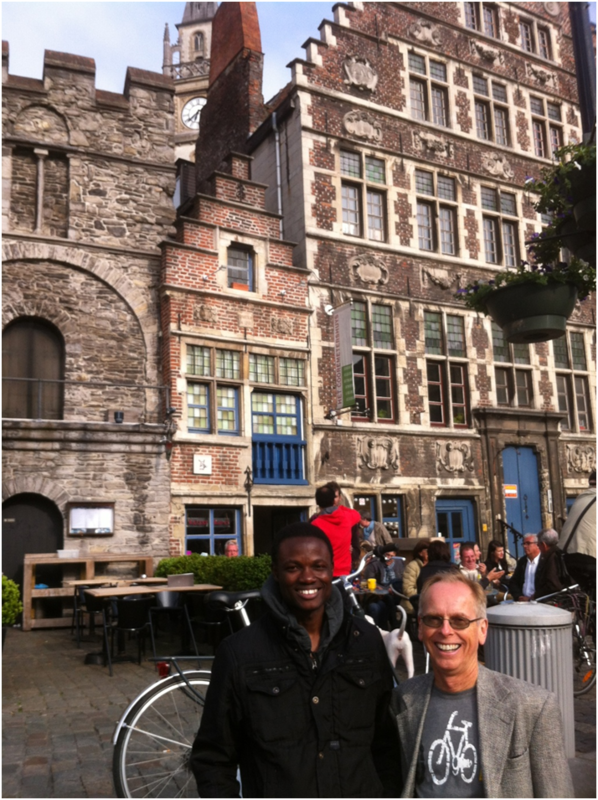 Here is a photo of Adewale and myself with some beautiful Ghent architecture behind us. I was pleased that ISBNPA 2013 was in Ghent so many people could get to know this walkable and bikeable city with extravagant architecture, lovely canals, a concentration of historic churches, and an imposing castle right in the center. Many of the attendees got a chance to know better the many impressive physical activity and nutrition behavior researchers based in Belgium. 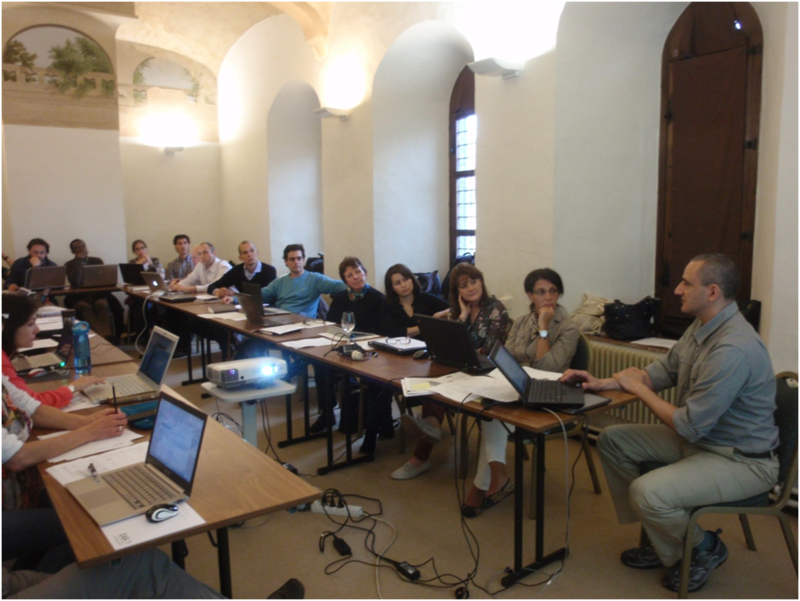 Most conference events were held in a centuries-old former monastery, lending an elegant atmosphere to the paper sessions. The content of the papers was very strong, and many younger investigators had the opportunity to present their excellent studies. IPEN investigators were well represented. 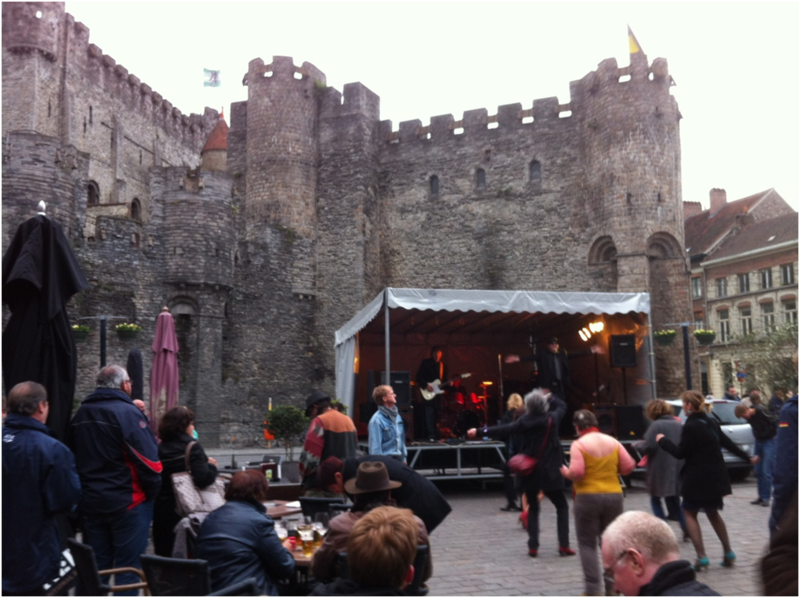 It was a treat to have the conference dinner in the Gravensteen castle, and the circus performers made everyone feel like it was the Middle Ages. Congratulations to Greet Cardon for organizing a successful conference, where the biggest problem was having 800+ attendees when the planning was for 500. I was pleased that ISBNPA also adopted active applause, crediting ALR. At the closing session I invited everyone to attend the 2014 ISBNPA Conference in San Diego (May 21-24). 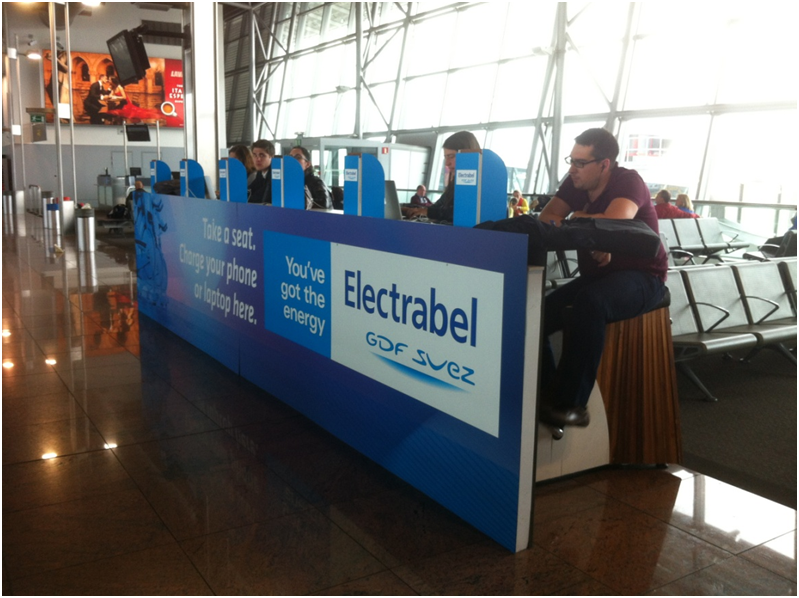 Look what I saw at the Brussels airport. 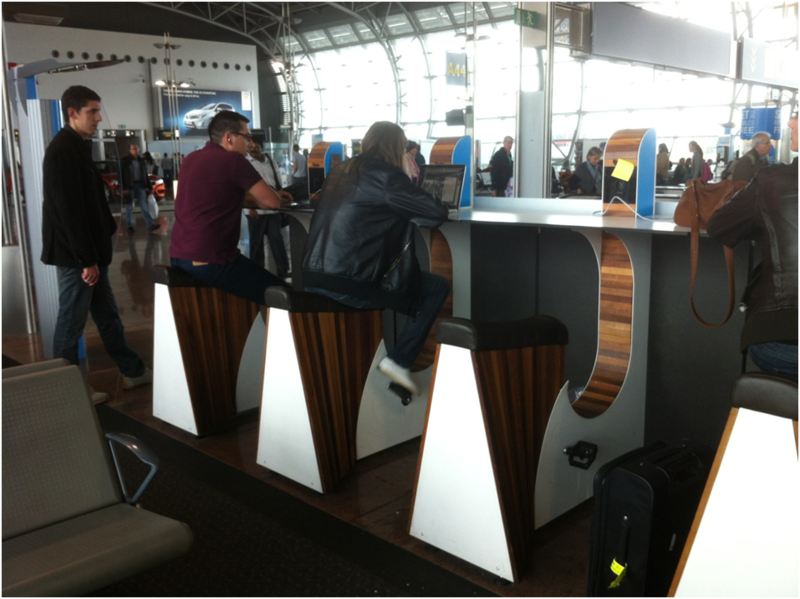 This is an exercycle you can use to charge your computer and phone. And people were using it!! I love this idea. Later I learned that a member of the Belgian Parliament is behind this company. 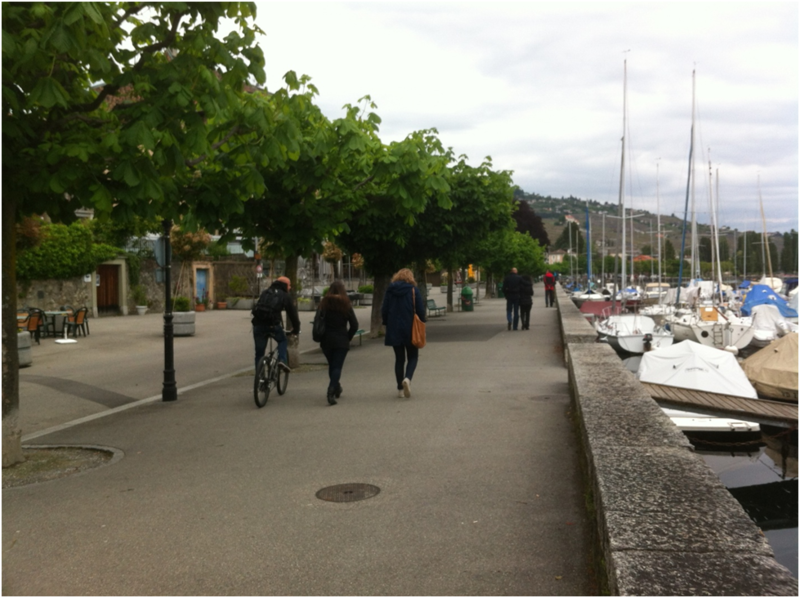 I had some business meetings for our Santech company in this small town in southwest Switzerland. 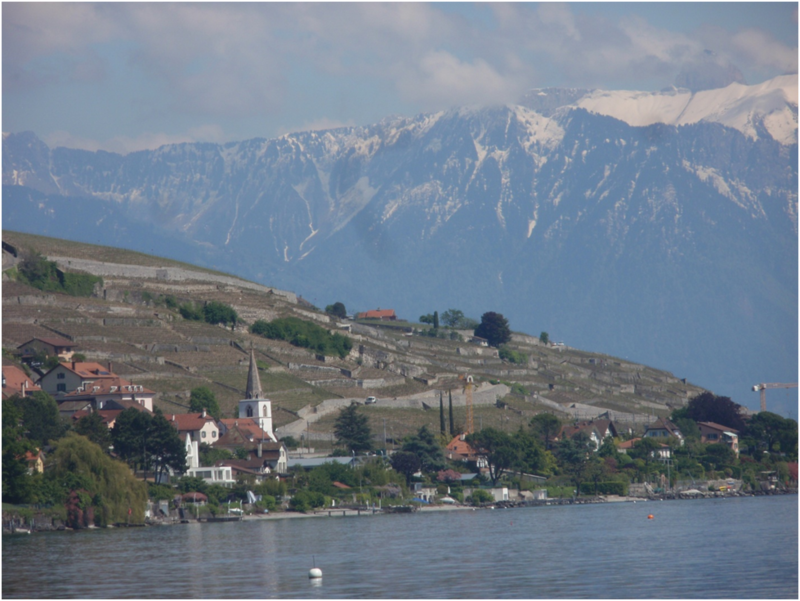 It is a World Heritage site because of the terraced vineyards in the area. 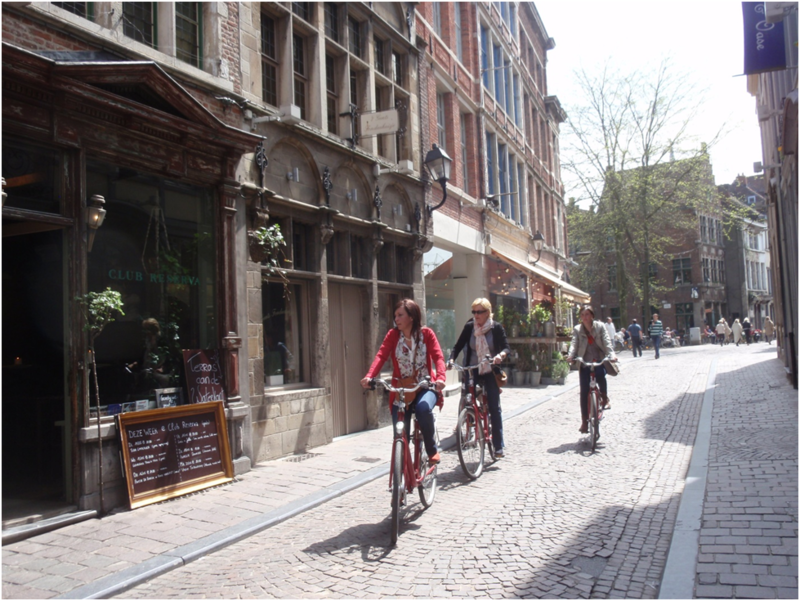 The narrow streets, limited traffic, and sidewalk cafes made for a great quality of life. The highlight for me was the view of Lake LeMans with the snow-capped French Alps on the other side. Spectacular, as you can see from the photos. The scenery was spectacular. That is France across the lake. ACSM is always packed with committee meetings, extra meetings, working dinners, and the usual paper and poster sessions. I congratulate outgoing ACSM President Janet Rankin Walberg on two symposia related to her ActivEarth initiative that highlights the co-benefits of health, environmental protection, and economics. 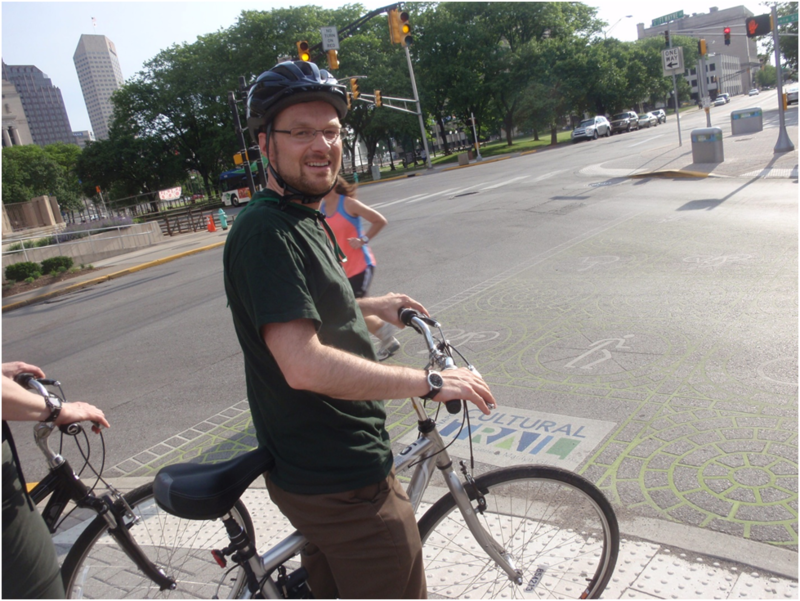 The first symposium was practice- and policy-oriented and featured great work from New York City, Indianapolis, and the League of American Bicyclists. I was a speaker in the second research-oriented symposium that included transportation planner Ralph Buehler, Karen Lee presenting evaluations of active transport interventions in New York City, and David Bassett. The content was outstanding, but unfortunately the attendance was sparse. I thank Janet for inviting me to deliver a Presidential Lecture, in which I touched on the past, present, and future of built environment research. I thank Billie Giles-Corti, Deborah Cohen, and Aaron Hipp for allowing me to present some of their recent work. A video will of the talk will be available in a few weeks, and we will post a link on my website. At the end of the talk, we enjoyed an Instant Recess activity break as a tribute to our treasured but departed colleague Toni Yancey. I was very pleased that an Instant Recess video was played before one of the plenary talks at ACSM. 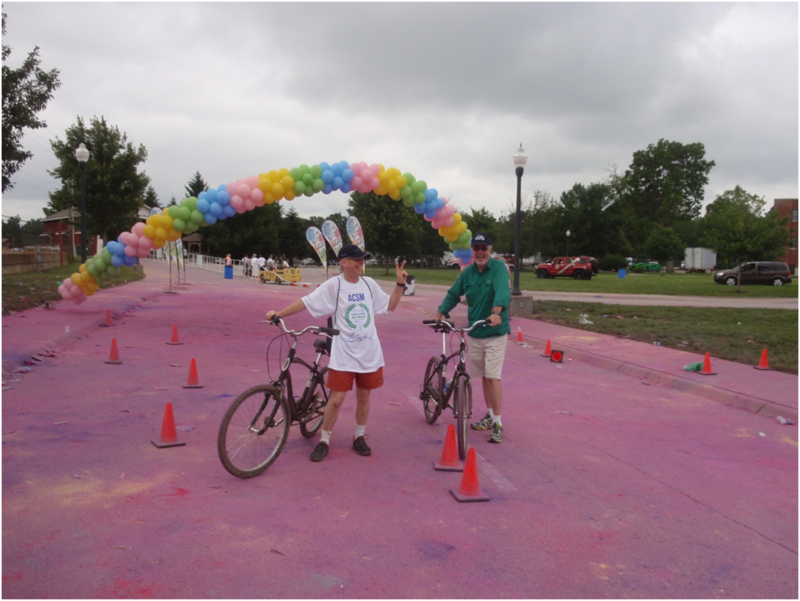 The final ActivEarth event was a bike and walking tour of the new Cultural Trail network in Indianapolis. This is a beautifully designed bike path (separated from traffic) that was built with private funds. It is a great way to get around the city, and it has already stimulated new residential and commercial investments. I was impressed that a Midwest city transferred traffic lanes to bike paths. This is a model I hope other cities adopt. I enjoyed talking to Ralph Buehler during the ride, and he said it is the best designed bike facility he has seen in North America. A few days later, Neville Owen and I went riding on the trail again, connecting to the Monon Rail-Trail for a safe and relaxing long ride. Way to go, Indy. I posted a few photos from these rides. 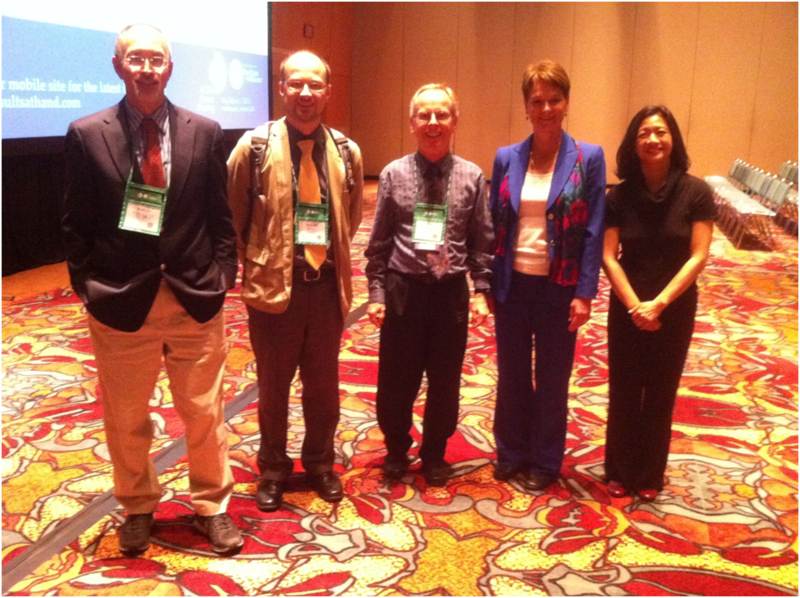 ActivEarth research symposium group at ACSM in Indianapolis May 2013. My last stop on this trip was Washington, DC. I thank Tracy Fox and Adam Zimmerman for arranging four visits with Congressional offices where I distributed and discussed ALR briefs on active transportation, biking, and school programs and policies. Just doing my part to make sure decision makers are informed about how physical activity can help solve several difficult issues faced in our country. The last event of the IOM Standing Committee on Childhood Obesity Prevention was the June 6-7 workshop on working toward equity in opportunities for healthy behaviors. This topic deserves more study, but critically, more action. I congratulate Program Chair Shiriki Kumanyika, Lynn Parker, and her IOM staff for creating an outstanding meeting that was held in the historic National Academy of Sciences Building on the Mall and webcast. Did you know that Abraham Lincoln started the National Academy of Sciences? The workshop was organized by the recommendations in the Accelerating Progress in Obesity Prevention report that was published in 2012. In her opening, Shiriki dedicated the workshop to the late Toni Yancey, who was a member of the Standing Committee since its beginning. I was honored to help lead an Instant Recess to carry on Toni’s work. I moderated the first panel, and in my opinion, it was outstanding. Robert Garcia from The City Project in Los Angeles surprised the crowd by explaining how civil rights law can be applied to improving opportunities for physical activity in communities of color. He then reported his impressive successes in creating new parks, with solid evidence and community engagement being key ingredients in those successes. Then Myron Floyd from North Carolina State University summarized the scientific evidence about the potential for parks to contribute to increased physical activity among disadvantaged communities as well as the challenges to realizing that potential. The workshop had many powerful and informative moments. 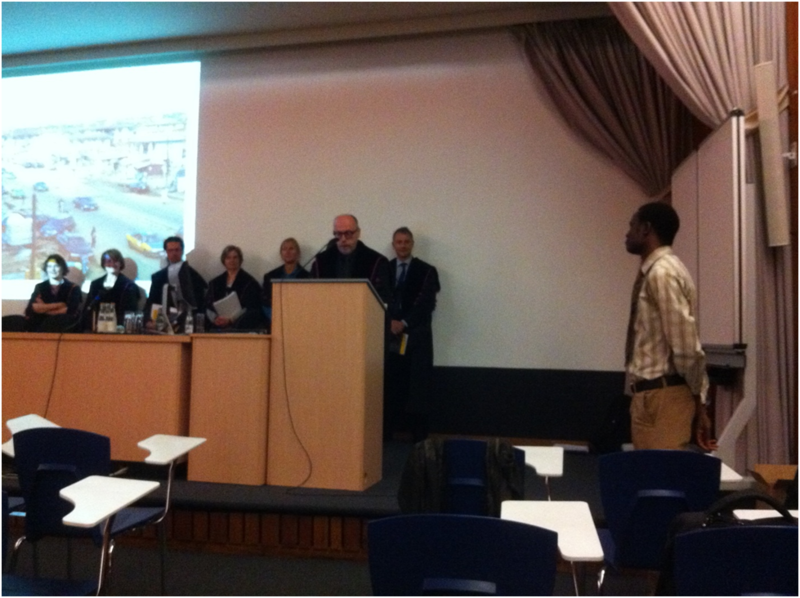 The videos will be posted on the IOM website, and a summary report will be published. By drjamessallis in Uncategorized on July 24, 2013 .